2013-10-13 08:37#137721 The 510 Series : Louis: They were in the Championship for 3 seasons; 2006-07, 2007-08, 2009-10. Today Stam came up with a project for kit makers, and what he wants is us to create the 2013/14 season kits for all clubs in a number of leagues without brand, sponsor and club logo. I ask all of you to try and make these kits, although no matter if you can't. That was 2008-09. They were relegated in 2006 and 2009. They were promoted in 2008 and 2010. 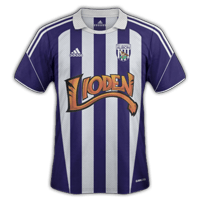 The only position we can reveal now is 3rd place, and the person who managed 3rd place most certainly deserves it, with two fantastic strips. 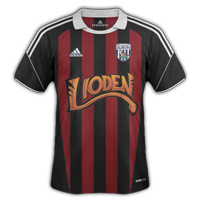 The kits may have been the same design but they both worked well together, being made by adidas and sponsored by the game Lioden. These kits, which managed an astonishing 5 votes out of 30, a whopping 16.7%, were made by Lucas. The winners can finally be announced, after a tense tiebreak, but one of our kit makers ran away with it in the end. Now, we will look at 2nd place. Leading the voting for much of the time, a late vote sent the competition into a tiebreak. 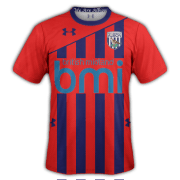 The kits were made by AlexTHFC and featured a wavy blue stripes design for the home and a great navy and red away kit. Unluckily, Alex only managed 6 votes in the tiebreak. With 11 votes in the tiebreak there was no doubt over who was going to win it. He came from behind in the usual voting spectacularly and eventually it was enough for edu1878 to win the tiebreak with 5 more votes than Alex. 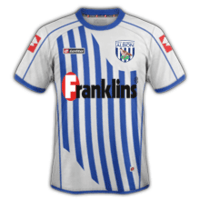 His kits featured the same design, blue and white stripes, with a major gap for the sponsor. I would like to thank everyone that voted for me in both polls, as well as Louis and the staff at FM Scout for providing the opportunity to participate in this great competition. I would like to congratulate Alex, who was a worthy adversary for the duration of the this competition. Well, so far in Kit of The Week, we've been doing just Premier League teams, as the grand kit pack will be coming. But it soon comes predictable, and it'll be easy to guess who is the team, right? Not anymore. This week, we will celebrate PSV's 100th anniversary and the Dutch Eredivisie and Eerste Divisie as we will make the home, away and third (even if the club doesn't have one) for any Dutch team, be it the national team, AFC Ajax, FC Oss or SC Cambur. The possibilities are endless, and you can go searching for any Dutch team, in any league. So if you're not keen on FC Twente, you can go for SC Enschede or Enschedese Boys, the two teams who merged to form Twente but stayed as 2 separate teams. You will make one team, and you must state the brand, sponsor and of course, the team. Check out the latest kits for each Eredivisie team with the link below. 2013-10-20 06:34#138733 Pauker : How about no? Another Kit of the Week ends in a tie and so we only have the 3rd place kits up here, yet the quality is so high anyway that any of these kits could have won. Let's take a look. Set 2 was a set of Feyenoord kits, sponsored by Ford and made by either Nike or adidas, no one really knows for sure. 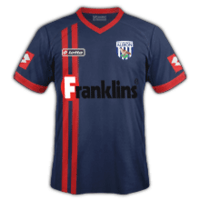 The kits featured the club's traditional red and white halved home, but with a great blue and silver away accompanied by a grey and light blue design on the 3rd strip. These kits belonged to Toon. 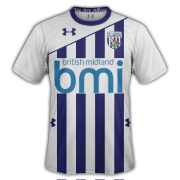 And just next to that was Set 3, for a lesser known lower league side FC Eindhoven, who are no doubt eclipsed by their local rivals PSV, but this time had better kits with a blue home, white away and green 3rd all featuring the same pinstripes. The kits were sponsored by VDL and the brand was Joma, these kits belonging to edu1878. Our 3rd set to be in 3rd place was AGOVV Apeldoorn, with their traditional blue home shirt with their traditional blue badge, with an away featured a blue design at the top and an orange 3rd kit. 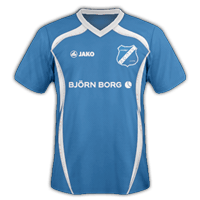 These kits were sponsored by Bjorn Borg and made by Jako, and they were the first time that the entrant, me, has entered Kit of The Week. Well done me. The red home shirt featuring a simple white collar, the blue away with the exact same design and a white chevron on a black kit for the 3rd, keeping it classy for FC Twente was Set 10, made by Zapdos the Great. The kits were Nike, sponsored by Aon. That's all we have for 3rd place, but soon the tiebreak thread will go up, and we can decide who has won KOTW. Thanks to a very late vote from an Evil Moderator who could still see the poll as he is not just Evil but a Moderator too (hence why he's the Evil Moderator) the competition will not be decided by a tiebreak. Now let's see who Akash the Evil Moderator that you will never know the identity of voted for. These kits may have been Nike designs but there was a whole lot more to them with the added eagle watermark, the symbol of Vitesse Arnhem, the team in question. The club had a yellow and black home, a blue and white away witha slight gradient and a green and darker green 3rd with a bigger gradient, each featuring the aforementioned eagle. The kits were made by AAN, and he used Fly Emirates as his sponsor. In 1st place, we have our second set of Feyenoord kits, featuring a slightly different design than is traditional for the Dutch club, with a white and gold stripe down the right, where the sponsor Martinair is placed. The same Nike design is on the away, in white with a gold and red stripe, and the 3rd uses just a plain black design. 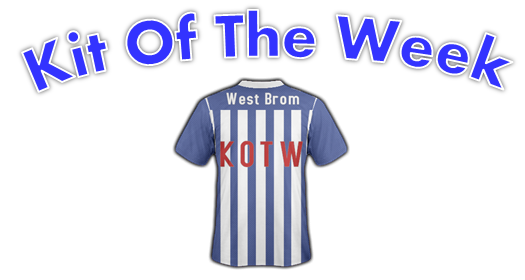 These kits, made by Mvan12, got the win by one vote over AAN, on Mvan's first KOTW entry! Tottenham Hotspur may be their nearest Premier League rivals so while there is no big derby the fans are still passionate and they are passionate about their side's kit. 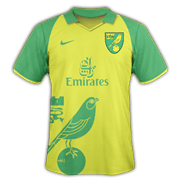 The Canaries have had a great bright yellow and green design, supplied by Errea for the last few years, but this time it won't be Errea, it'll be you. Make only a home and an away. 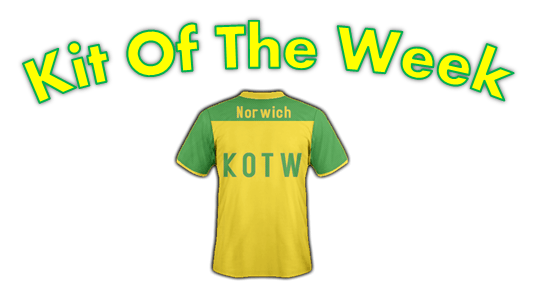 Another Kit of the Week is done and so more results must be announced! This time it was Norwich so let's see what you did. Well... it's basically... got stars on it, and gradient sleeves, and ugh. The away wasn't too bad, I suppose, but how the Hell did Justice come in 3rd with these? In 2nd place was Set 1, sponsored by Natxis and using Nike as the brand. 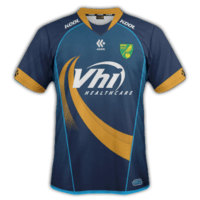 The home sees two shades of yellow, with two shades of green and an arrow design on the away. The batle was hard fought and whilst these kits led with 5 votes most of the time, they could only manage one more and dropped to second. These kits were made by Nick. He's entered 3 times before; he never got close to winning. Yet this time, he has! 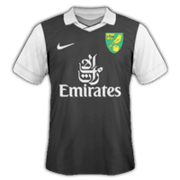 The home featured the team's canary coming from under the sleeve, and the away had a simple white sleeve design, made by Nike and sponsored by Emirates. It was tight, and neeeded a very late vote to win it, but thats exactly what happened. TVDLC123 wins this week. Thanks to everyone who voted for me, all the other kits were great, so I feel really proud being crowned the winner this week. 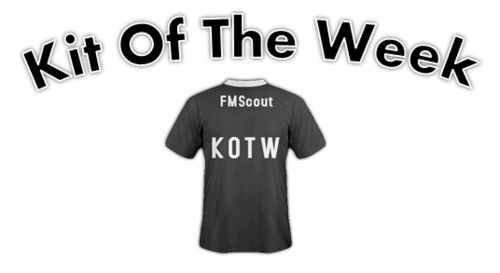 You are reading "FMScout Kit Of The Week Competition".